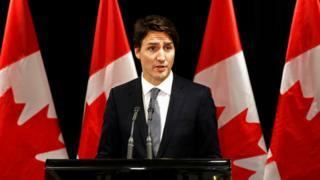 Image caption Canadian Prime Minister Justin Trudeau called the attempted suicides "heartbreaking"
An indigenous community in northern Canada has declared a state of emergency after 11 people attempted to take their own lives in one day. The Attawapiskat First Nation in Ontario saw 28 suicide attempts in March and more than 100 since last September, Canadian media said, with one person reported to have died. Prime Minister Justin Trudeau called the news "heartbreaking". Canada's 1.4 million indigenous people have high levels of poverty. Their life expectancy is also below the Canadian average. Bruce Shisheesh, the chief of the Attawapiskat First Nation community, said 11 people attempted to take their own lives on Saturday, prompting him to declare a state of emergency. He tweeted that the regional Weeneebayko Health Authority was flying in a crisis team, mental health nurses and social workers, and that he was waiting for Ontario's minister of health to deliver more emergency workers to the area. The First Nations government was sending a crisis response unit to the community following the declaration on Saturday, Canadian media said. The Health Canada federal agency said in a statement it had sent two mental health counsellors as part of that unit. Charlie Angus, the local MP, said: "This is a systemic crisis affecting the communities." "There's just not been a serious response from any level of government until now," he said. "We'll continue to work to improve living conditions for all Indigenous peoples," Prime Minister Trudeau said. Another Canadian aboriginal community in the western province of Manitoba appealed for federal aid last month, citing six suicides in two months and 140 suicide attempts in two weeks. Suicide and self-inflicted injuries are among the top causes of death for First Nations, Métis and Inuit people, according to studies from Health Canada. National Chief of the Assembly of First Nations Perry Bellegarde called for a national strategy to combat indigenous suicide last month. "Immediate support to communities is essential & a #FirstNations driven national strategy on mental health," he tweeted on Monday.